Welcome home! Stylish, move-in ready 2-story home is located in popular Sedona Subdivision in Lake St. Louis! This 5 bed, 3.5 bath offers impressive upgrades: laminate flooring throughout the main level, main floor laundry, plus a Chef's kitchen with tons of light flowing through as well as a smooth-top electric stove & rich espresso kitchen cabinets. Mastersuite features vaulted ceiling, walk-in closet & luxury bath with separate tub/shower & double sinks. There are 3 more spacious bedrooms on the second floor. As an added bonus, you will find a sizable, level yard which makes this property perfect for entertaining family & friends! Let's not forget about the finished lower level with full bath, 5th bedroom & recreation area for watching movies/sports or playing games. 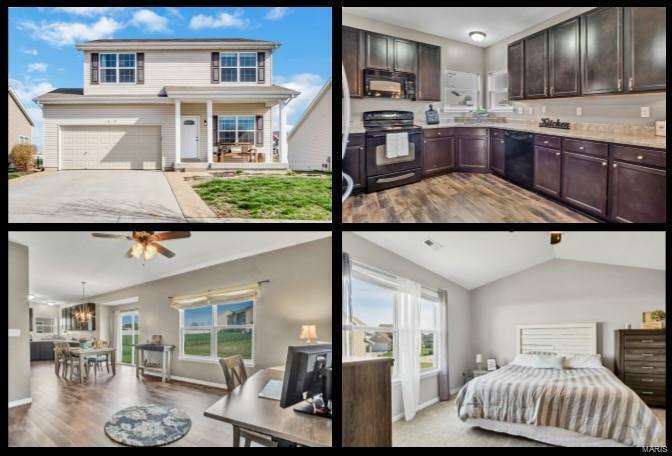 Close to shopping, dining, highways 61/40/70 & award-winning Wentzville schools! Don't miss out, this one won't last long.